الغزوات المنغولية لليابان (元寇, Genkō? ), which took place in 1274 and 1281, were major military efforts undertaken by Kublai Khan to conquer the Japanese archipelago after the submission of Goryeo (Korea) to vassaldom. Ultimately a failure, the invasion attempts are of macro-historical importance because they set a limit on Mongol expansion and rank as nation-defining events in the history of Japan. The Mongol invasions are considered a precursor to early modern warfare. One of the most notable technological innovations during the war was the use of explosive, hand-thrown bombs. The invasions are referred to in many works of fiction, and are the earliest events for which the word kamikaze ("divine wind") is widely used, originating in reference to the two typhoons faced by the Mongol fleets. After a series of Mongol invasions of Korea between 1231 and 1281, Goryeo signed a treaty in favor of the Mongols and became a vassal state. Kublai was declared Khagan of the Mongol Empire in 1260 (although this was not widely recognized by the Mongols in the west) and established his capital at Khanbaliq (within modern Beijing) in 1264. Japan at the time was ruled by the Shikken (shogunate regents) of the Hōjō clan, who had intermarried with and wrested control from Minamoto no Yoriie, shōgun of the Kamakura shogunate, after his death in 1203. The inner circle of the Hōjō clan had become so preeminent that they no longer consulted the council of the shogunate (Hyōjō (評定? )), the Imperial Court of Kyoto, or their gokenin vassals, and made their decisions at private meetings in their residences (yoriai (寄合?)). The Mongols also made attempts to subjugate the native peoples of Sakhalin—the Ainu, Orok, and Nivkh peoples—from 1260 to 1308. 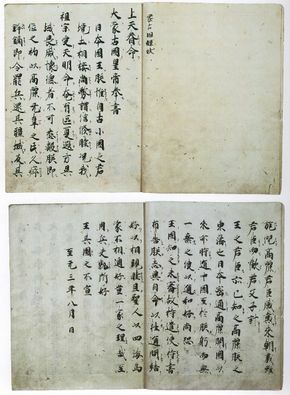 Letter from Kublai Khan to the "King of Japan" (日本國王), written in Classical Chinese (the lingua franca in East Asia at the time), dated 8th Month, 1266. Now stored in Tōdai-ji, Nara, Japan. Cherished by the Mandate of Heaven, the Great Mongol emperor sends this letter to the king of Japan. The sovereigns of small countries, sharing borders with each other, have for a long time been concerned to communicate with each other and become friendly. Especially since my ancestor governed at heaven's command, innumerable countries from afar disputed our power and slighted our virtue. Goryeo rendered thanks for my ceasefire and for restoring their land and people when I ascended the throne. Our relation is feudatory like a father and son. We think you already know this. Goryeo is my eastern tributary. Japan was allied with Goryeo and sometimes with China since the founding of your country; however, Japan has never dispatched ambassadors since my ascending the throne. We are afraid that the Kingdom is yet to know this. Hence we dispatched a mission with our letter particularly expressing our wishes. Enter into friendly relations with each other from now on. We think all countries belong to one family. How are we in the right, unless we comprehend this? Nobody would wish to resort to arms. Kublai essentially demanded that Japan become a vassal and send tribute under a threat of conflict. However, the emissaries returned empty-handed. A second set of emissaries were sent in 1268, returning empty-handed like the first. Both sets of emissaries met with the Chinzei Bugyō, or Defense Commissioner for the West, who passed on the message to Shikken, Hōjō Tokimune, Japan's ruler in Kamakura and to the Emperor of Japan in Kyoto. After discussing the letters with his inner circle, there was much debate, but the Shikken had his mind made up; he had the emissaries sent back with no answer. The Mongols continued to send demands, some through Korean emissaries and some through Mongol ambassadors on March 7, 1269; September 17, 1269; September 1271; and May 1272. However, each time, the bearers were not permitted to land in Kyushu. The Imperial Court suggested compromise, but really had little effect in the matter, due to political marginalization after the Jōkyū War. The uncompromising shogunate ordered all those who held fiefs in Kyūshū, the area closest to the Korean Peninsula and thus most likely to be attacked, to return to their lands and forces in Kyūshū moved west, further securing the most likely landing points. After acknowledging its importance, the Imperial Court led great prayer services, and much government business was put off to deal with this crisis. قالب:Refimprove section According to the Yuanshi, the Yuan fleet set out with an estimated 15,000 Mongol and Chinese soldiers and 1,600–8,000 Korean soldiers in 300 large vessels and 400–500 smaller craft along with several thousand sailors, although figures vary considerably depending on the source and many modern historians consider the numbers exaggerated. The primary port for the operation was Quanzhou in Fujian, then the center of China's maritime trade. They landed on Komodahama beach on Tsushima Island on October 5, 1274. Sō Sukekuni, governor of Tsushima, led a cavalry unit of 80 to defend the island, but he and his outnumbered unit were killed in the engagement. The Mongols and Koreans subsequently invaded Iki. Tairano Takakage, the Governor of Iki, fought the invaders with about 100 of his cavalrymen, but he killed himself after his unit was defeated. The Mongol forces landed on November 19 in Hakata Bay, a short distance from Dazaifu, the ancient administrative capital of Kyūshū. The following day brought the Battle of Bun'ei (文永の役), also known as the "First Battle of Hakata Bay". The Japanese coalition force opposing them included 120 armed samurai each with a warband and likely numbered between 3,000 and 6,000 strong. Later accounts have both sides believing themselves to be drastically outnumbered by the enemy; the Yuanshi provides an estimate of 102,000 for the Japanese force, while the Japanese Hachiman Gudokun describes the invaders as outnumbering the Japanese 10 to 1. Conlan argues that the Yuanshi's account of the battle suggests that both the Japanese and Yuan forces were of similar size. The Japanese were inexperienced in managing such a large force (all of North Kyūshū had been mobilized), and the Mongols made significant initial progress. It had been approximately 50 years since the last major combat event in Japan (Go-Toba's adherents in 1221), leaving not a single Japanese general with adequate experience in moving large bodies of troops. In addition, the style of warfare that was customary within feudal Japan involved single combat, even on large battlefields. The Mongols possessed foreign weapons which included superior long-range armaments (the short composite bows that the Mongols were famous for, with poisoned arrows, fire arrows, bow-launched arrows with small rocket engines attached and gunpowder-packed exploding arrows and grenades with ceramic shells thrown by slings to terrify the enemy's horses), and easily had the upper hand in open land combat. The Japanese force at Hakata Bay needed time to await the arrival of reinforcements, with which they would be able to overwhelm the Mongol invaders. Around nightfall, a typhoon caused the Mongol ship captains to suggest that the land force reembark in order to avoid the risk of being marooned on Japanese soil. By daybreak, only a few ships had not set out to sea. Those that had were destroyed by the storm. Some accounts offer casualty reports that suggest 200 Mongol ships were lost. 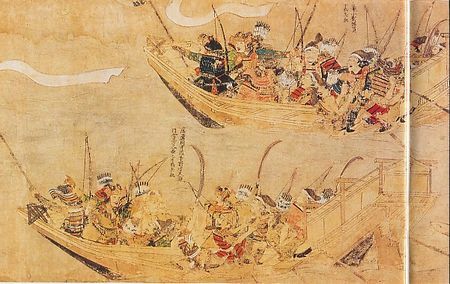 However, small Japanese boats were much more swift and maneuverable than Mongol ships, and the Japanese were able to board the remaining ships of the crippled Mongol army. The samurai approached and boarded the ships under cover of darkness and fell on the invaders ferociously. In the small confines of the ships, during the predawn darkness, the Mongols (trained as cavalrymen and horse archers) were unable to bring their bows to bear effectively. However, the long, thin Japanese swords got stuck and snapped off in the thick, boiled leather armor of the Mongols, causing Japanese blacksmiths to reevaluate their swords after the first invasion. This led to the beginning of the divergence of the katana from existing tachi swords in the 13th and 14th century. A story widely known in Japan is that back in Kamakura, Tokimune was overcome with fear when the invasion finally came, and wanting to overcome his cowardice, he asked Mugaku Sogen, his Zen master also known as Bukko, for advice. Bukko replied he had to sit in meditation to find the source of his cowardice in himself. Tokimune went to Bukko and said, "Finally there is the greatest happening of my life." Bukko asked, "How do you plan to face it?" Tokimune screamed, "Katsu!" ("Victory!") as if he wanted to scare all the enemies in front of him. Bukko responded with satisfaction, "It is true that the son of a lion roars as a lion!" Since that time, Tokimune was instrumental in spreading Zen and Bushido in Japan among the samurai. On October 5, About 1,000 soldiers of Mongolian Army landed at Komoda Beach. Sō Sukekuni (ja) (宗助国), Shugodai of Tsushima Island was killed in action. The Mongolians slaughtered many dwellers of Tsushima island. On October 14, Taira no Kagetaka (ja), Shugodai of Iki led about 100 soldiers. They were defeated by the Mongolian army and he committed suicide in Hizume Castle (樋詰城). About 1,000 Japanese soldiers were killed there. On October 16 to 17, the Mongolian army attacked the base of the Sashi clan. Hundreds of Japanese soldiers and Sashi Fusashi (ja), Sashi Tomaru (佐志留) and Sashi Isamu (佐志勇) were killed. The Mongolian Army landed on Sawara District and encamped at Akasaka. On seeing this situation, Kikuchi Takefusa surprised the Mongolian army. The Mongolians escaped to Sohara, after losing about 100 soldiers. Thousands of Mongolian soldiers were massed in Torikai-Gata. Takezaki Suenaga (竹崎季長), one of the Japanese commanders, attacked the Mongolian army and fought them. Soon, reinforcements led by Shiraishi Michiyasu (ja) arrived and defeated the Mongolians soundly. The Mongolian casualties of this battle were about 3,500. Due to the defeat in battle of Torikai-Gata, the Mongolian army was exhausted and withdrew to their ships. On seeing this situation, the Japanese army engaged in night attacks and killed many soldiers. Finally, Hong Dagu decided to withdraw to the Yuan-held continent. In the midst of withdrawal, they met a typhoon, most of their ships sank and many soldiers drowned. Starting in 1275, the shogunate increased efforts to defend against the second invasion, which they thought was sure to come. 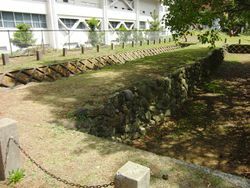 In addition to better organizing the samurai of Kyūshū, they ordered the construction of forts and a large stone wall (石塁, Sekirui), and other defensive structures at many potential landing points, including Hakata Bay, where a two meter high wall was constructed in 1276. Religious services increased and the Hakozaki Shrine, having been destroyed by the Yuan forces, was rebuilt. A coastal watch was instituted and rewards were given to some 120 valiant samurai. There was even a plan for a raid on Goryeo (modern-day Korea) to be carried out by Shōni Tsunesuke, a general from Kyūshū, though this was never executed. After the failed invasion, Kublai Khan was tired of being ignored and not being allowed to land, so five Yuan emissaries were dispatched in September 1275 and sent to Kyūshū, refusing to leave without a reply. Tokimune responded by having them sent to Kamakura and then beheading them. The graves of those five executed Yuan emissaries exist to this day at Jōryū Temple in Fujisawa, Kanagawa, near the Tatsunokuchi Execution Place in Kamakura. Then again on July 29, 1279, five more Yuan emissaries were sent in the same manner, and again beheaded, this time in Hakata. Expecting another invasion, on Feb 21, 1280, the Imperial Court ordered all temples and shrines to pray for victory over the Yuan. In the spring of 1281, the Mongols sent two separate forces. Per the Yuanshi, an impressive force of 900 ships containing 17,000 sailors, 10,000 Korean soldiers, and 15,000 Mongols and Chinese set out from Masan, Korea, while an even larger force of 100,000 sailed from southern China in 3,500 ships, for a combined force of 142,000 soldiers and sailors. Japanese sources also mention 150,000 men in the invading force. Many modern historians believe these to be exaggerated figures, as were common in medieval chronicles. Professor Thomas Conlan states that they were likely exaggerated by an order of magnitude (implying 14,000 soldiers and sailors), expressing skepticism that a medieval kingdom managed an invasion on the scale of D-Day during World War II across over ten times the distance, and questions if even 10,000 soldiers attacked Japan in 1281. Morris Rossabbi states that Conlan was correct in his assertion that the invasion force was much smaller than traditionally believed, but argues that the expenditures lavished on the mission confirm that the fighting force was sizable and much larger than 10,000 troops. He puts forward the alternative figure of 70,000 men, half of what is spoken of in the Yuanshi and later Japanese claims. Turnbull thinks that 140,000+ is an exaggeration, but does not offer his own precise estimate for the size of the army. Rather, he only states that given the contributions of the Southern Song, the second invasion should've been around three times larger than the first. As he earlier listed the common figure of 23,000 for the first invasion uncritically, unlike the estimate of 140,000+ for the second, that would imply an invasion force of ~70,000, on par with Rossabbi's estimate. The Mongols' plan called for an overwhelming coordinated attack by the combined imperial Yuan fleets. The Chinese fleet of the Yuan was delayed by difficulties in provisioning and manning the large number of ships they had. The Mongol fleet set sail, suffered heavy losses at Tsushima, and turned back. In the summer, the fleet took Iki-shima and moved on to Kyūshū, landing at several different locations. In a number of individual skirmishes, known collectively as the Kōan Campaign (弘安の役) or the "Second Battle of Hakata Bay", the Mongol forces were driven back to their ships. The Japanese army was heavily outnumbered, but had fortified the coastal line with two-meter high walls, and was easily able to repulse the auxiliaries that were launched against it. 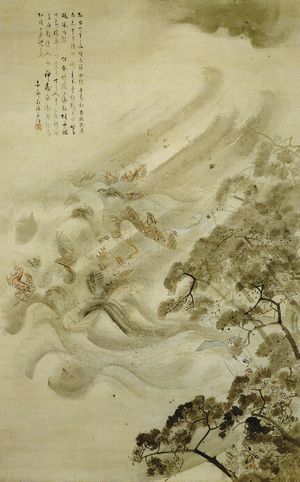 Beginning August 15, the now-famous kamikaze, a massive typhoon, assaulted the shores of Kyūshū for two days straight, and destroyed much of the Mongol fleet. Sensing the oncoming typhoon, Korean and south Chinese mariners retreated and unsuccessfully docked in Imari Bay where they were destroyed by the storm. Furthermore, it is now believed that the destruction of the Mongol fleet was greatly facilitated by an additional factor. Most of the invasion force was composed of hastily acquired flat-bottomed Chinese riverboats and ships built in Goryeo and all of a similar type. According to Goryeosa, Southern Song-type ships were too costly and their construction was too slow, so the traditional types were constructed instead. Such ships (unlike ocean-going ships, which have a curved keel to prevent capsizing) were difficult to use on high seas, let alone during a massive typhoon. On May 21, the Mongolian Army landed on Tsushima island and invaded. They met fierce resistance there and later withdrew. On the morning of June 8, the Japanese army divided their force into two and attacked along Umi no Nakamichi. The Japanese army lost 300 soldiers but defeated Hong Dagu, who nearly died in this battle, and Zhang Cheng. On June 9 Zhang Cheng solidified the defense of his army but the Mongolian army was again defeated by the fierce Japanese attacks. After this defeat the Mongolian army escaped to Iki Island. On June 29, a Japanese army of approximately 10,000, led by the Matsura clan, Ryūzōji clan and Takagi clan began an all-out attack on Iki Island. On July 2, Ryōzōji Iekiyo landed on Setoura beach and defeated the Mongolian army. As a result, the Mongolian army abandoned Iki Island and withdrew to Hirado Island. On July 5, Takezaki Suenaga attacked and annihilated the Mongolian Navy. After this battle, most of the commanders of the Mongolian army escaped to their own country. On July 7, there were about 100,000 soldiers of the Mongol army without commanders. Upon realizing this situation, the Japanese army launched an attack. Togo Korechika, Togo Koretoo, Fujiwara Sukekado and Shimazu Nagahisa annihilated the remaining Mongolian army and took 20,000 to 30,000 prisoners in this battle. At the completion of this battle, Japan's victory was confirmed. According to our manner of fighting we must first call out by name someone from the enemy ranks, and then attack in single combat. But the Mongols took no notice at all of such conventions. They rushed forward all together in a mass, grappling with any individuals they could catch and killing them. The Mongol method of advances and withdrawals accompanied by bells, drums and war cries was also unknown in Japan, as was the technique of Mongolian archers, which involved shooting arrows en masse into the air rather than long-ranged one-on-one combat. The Zen Buddhism of Hojo Tokimune and his Zen master Bukko had gained credibility beyond national boundaries, and the first mass followings of Zen teachings among samurai began to flourish. The Mongol invasions of Japan facilitated a change in the designs of Japanese swords. Thin tachi and chokuto style blades were often unable to cut through the boiled leather armor of the Mongols, with the blades often chipping or breaking off. Tachi blades were shortened and thickened, with the katana eventually being introduced as a result. The failed invasions also mark the first use of the word kamikaze ("Divine Wind"). The fact that the typhoon that helped Japan defeat the Mongol Navy in the first invasion occurred in late November, well after the normal Pacific typhoon season (May to October), perpetuated the Japanese belief that they would never be defeated or successfully invaded, which remained an important aspect of Japanese foreign policy until the very end of World War II. The failed invasions also demonstrated a weakness of the Mongols – the inability to mount naval invasions successfully (see also Mongol invasions of Vietnam.) After the death of Kublai, his successor, Temür Khan, unsuccessfully demanded the submission of Japan in 1295. The Mongols and the Ashikaga shogunate of Japan made peace in the late 14th century during the reign of Toghon Temür, the last Yuan emperor in Khanbaliq. Long before the peace agreement, there was stable trade in East Asia under the dominance of the Mongols and Japan. As a consequence of the destruction of the Mongol fleets, Japan's independence was guaranteed. Simultaneously, a power struggle within Japan led to the dominance of military governments and diminishing Imperial power. Stoneware bombs, known in Japanese as Tetsuhau (iron bomb), or in Chinese as Zhentianlei (thunder crash bomb), excavated from Takashima shipwreck, October 2011. The Mongol invasions are an early example of gunpowder warfare. One of the most notable technological innovations during the war was the use of explosive bombs. The bombs are known in Chinese as "thunder crash bombs" and were fired from catapults, inflicting damage on enemy soldiers. An illustration of a bomb is depicted in a Japanese scroll, showing their use by the Mongols against mounted samurai. Archaeological evidence of the use of gunpowder was finally confirmed when multiple shells of the explosive bombs were discovered in an underwater shipwreck off the shore of Japan by the Kyushu Okinawa Society for Underwater Archaeology. X-rays by Japanese scientists of the excavated shells provided proof that they contained gunpowder. ^ Thomas, p. 261-263; cites a variety of estimate from various Japanese historians as well as the author's own. ^ أ ب Stephen Turnbull (19 February 2013). The Mongol Invasions of Japan 1274 and 1281. Osprey Publishing. pp. 41–42. ISBN 978-1-4728-0045-9. Retrieved 16 April 2013. ^ Allaire, Gloria (2000), "Zaiton", in John Block Friedman, Trade, Travel, and Exploration in the Middle Ages: An Encyclopedia, Abingdon: Routledge . ^ Turnbull 2013: "About 120 armed samurai received rewards for their participation in 1275... If the average warband was 50-strong then the Japanese defenders may have been about 6,000. Other non-rewarded samurai took part, some with as few as one follower, so perhaps a figure between 3,000 and 6,000 is most likely for 1274." ^ Turnbull 2013, p. 42: "For partial justification of their defeat in 1274, the number of Japanese warriors ranged against the invaders is given in the Yuan Shi as the very unlikely figure of 102,000 ... Hachiman Gudokun, by contrast, sees the brave Japanese as being outnumbered by the Mongols by a factor of ten to one." ^ Jonathan Clements (7 February 2013). A Brief History of the Samurai. Little, Brown Book Group. p. 93. ISBN 978-1-4721-0772-5. ^ 福岡市教育委員会 (1969). "福岡市今津元寇防塁発掘調査概報". Comprehensive Database of Archaeological Site Reports in Japan. Retrieved 2016-09-02. ^ Rossabi, Morris. "Khubilai Khan: His Life and Times." 1988. Page xiii. ^ "The Mongols in World History | Asia Topics in World History". afe.easia.columbia.edu. Retrieved 2018-04-05. ^ Delgado, James (February 2003). "Relics of the Kamikaze". Archaeology. Archaeological Institute of America. 56 (1). Sansom, George. (1958). A History of Japan to 1334, Stanford University Press, 1958. Conlan, Thomas. (2001). In Little Need of Divine Intervention, Cornell University Press, 2001 – includes a black-and-white reproduction of the Mōko Shūrai Ekotoba, as well as translations of relevant Kamakura-era documents and an essay by Prof. Conlan concerning the Invasions (in which he argues that the Japanese were better placed to withstand the Mongols than traditionally given credit for). The essay is available in pdf form at this link.